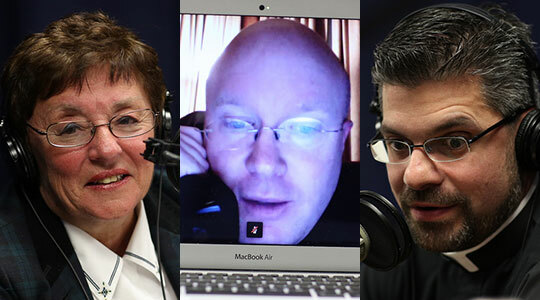 Summary of today’s show: After the final votes have been tallied, Scot Landry and Fr. Matt Williams analyze the results of Election Day, starting with the bright spot of the defeat of Question 2 and assisted suicide, including how the results broke down by city and town and the question of whether a particular pastor’s homily led to the biggest win for No on 2 in the state. They then turn their attention to national races and look at what it portends for the Catholic Church and culture of life over the next four years and even beyond. 1st segment: Scot Landry said today will be like the post-game show of the election where they will comment on what happened, what everyone saw, and all the results. Scot asked Fr. Matt Williams what time he went to bed. He said 3am. Scot went to bed at 1:30. Janet Benestad said she was up all night worrying about Question 2. Fr. Roger Landry went to bed at 3:15am. Scot said it was an amazing night with mixed emotions for him. It’s tough not to be pleased by the win for life against assisted suicide, which finally tallied as a win by 2%. Janet said she kept hitting the refresh on her computer all night as the counted precincts came close to 100%. She is grateful to Cardinal Seán for his leadership. She reminded everyone that No on 2 was down by 30 points on this question in the polls at one point. Every one at the Archdiocese and the other 3 dioceses in Massachusetts are grateful today. Scot said ESPN columnist Bill Simmons do a sports diary throughout a game. He asked Fr. Matt what he was thinking at different parts of the night about Question 2. Fr. Matt said he was at LIFT last night and praying before the Blessed Sacrament for the defeat of Question 2. At one point he was very concerned at being down, considering how everything else was going all night. Scot asked Fr. Roger about his day at the polls and what his night was like. Fr. Roger said he went out to hold signs at the polls yesterday to vote No on 2. For about 3 hours while they were freezing, they were getting many more honks of support than the typical derision you get when you stand up in public. He sensed the people were excited to see two priests holding signs for No on 2.He said about 12 other people were at that poll for the same issue. Sixty-three percent of Fall River voters voted No on 2. About 9pm last night he became aware of the Question 2 as he watched local television. He watched how the percent counted rose so slowly and even seemed to stall after midnight. He was exhilarated by the morning to have this ray of sunshine. Scot said by 7:05 he started to realize that all the polls that so many had said were improperly weighted seemed to be right and so it seemed the nation would go that way. So as he checked the Boston Globe’s site, he saw Question 2 was a 50-50 vote right off the bat and then both Plymouth and North Andover come in and were clearly wrong, saying those towns were about 96%. He said the North Andover count had to be off so as he reached midnight he thought the margin was much higher than being reported. Then the remaining towns would be a wash. As it runs out 51.1 percent of Mass. voters voted no on Question 2. Scot took all 351 cities and towns and four hadn’t reported data yet and of the remaining, the #1 community to vote No on 2 was Lawrence, Mass. He’s somewhat surprised because he had worried that the Spanish materials produced for the campaign hadn’t got through. But a good friend of his went to St. Patrick’s in Lawrence three weeks ago who said he had just heard the best homily of his life from Fr. Paul O’Brien on Question 2. 69.4% of voters in Lawrence voted no on 2. Janet said she’d heard from people who work in Spanish-speaking ministry that they’d been talking about it to every group they could. She said there was also an interview with the Univision SPanish-language network did an interview with Fernando Fernandez on Question 2. She said these votes counted, given how close the vote was. Scot said it’s clear base on this vote in Lawrence and others that Spanish-speaking immigrants in Massachusetts speak up for life. Scot gave the list of the top 30 towns in order of voting No on 2. Fr. Roger said he was somewhat surprised by some of the results. He congratulated his colleague at the only parish in Acushnet whose been out holding signs with parishioners for the past six weeks. He hadn’t realized that a parish could have such an impact. He was surprised at the results in cities as opposed to towns because the voting rates tend to be lower. But in Fall River he was able to motivate the seniors to recognize how vulnerable they are, and seniors vote in high numbers. Fr. Roger said he wasn’t surprised at the results in some cities and towns when he looked at who the pastors are in those places. Scot said in Holbrook which was a good turnout, 58% voted No, but in the next town of Avon, 74% voted Yes, surrounded by every single community voting majority No. He asked what they did in Holbrook to get such a strong response. Fr. Matt said he’s not familiar how St. Michael’s in Avon carried out their mission, but at St. Joseph’s ion Holbrook played the Cardinal’s homily and Fr. John Currie and Fr. Matt have preached on this over the months. They didn’t do anything remarkable. They just did what they were told to do and owned it and it worked. He also noted that Lynn was in the top 10 and thinks that a video project they did with students at St. Mary’s in Lynn on this subject might have had an effect. Scot noted that Waltham has six or seven border communities around, including Newton, Lexington, Concord, and Belmont, and while all the others voted Yes on 2, Waltham came out No on 2. He said all the parishes in Waltham did a good job, although Our Lady Comforter of the Afflicted organized all the politicians in town to research the issue and take a position. Every single one of them voted No on 2. A parishioner took out a full-page ad with the statement saying that all the politicians including the mayor were opposed to Question 2. Janet noted the parish also did a great cable access show and then promoted that on various stations. “Tuesday’s vote demonstrates that the people of the Commonwealth recognize that the common good was best served in defeating Question 2. The Campaign Against Physician Assisted Suicide brought together a diverse coalition from medical, disability rights and interfaith communities, all dedicated to ensuring that our residents were well informed about this issue. Our society must continue to work with hospice organizations and other palliative care providers to improve the care provided to the terminally ill. Patients are best served when the medical professionals, families and loved ones provide support and care with dignity and respect. Scot said Cardinal Seán told him how he was moved by seeing how many Catholics took yard signs, shared information with neighbors and family and stood out at the polls. Scot thinks more than anything word-of-mouth won this campaign and Janet agreed. She said Cardinal Seán used every avenue available to him to make sure everyone in the Commonwealth knew about this. Scot asked Fr. Roger what he thinks people will think about the Church’s involvement in this campaign. He’s heard from priests around the country who were surprised to see the comeback on this issue. He sent back an email describing how the Church got her corporate act together to inform and educate. Fr. Roger said he takes some learning experiences from it. He wishes we hadn’t waited so long. He’s a little concerned with the whole messaging of it. If he were a supporter of assisted suicide he would find someone on Beacon Hill to craft a new bill in the Legislature. He hopes that they’ve discouraged the pro-assisted suicide people enough and encouraged people around the country that we can win on matters of life. The third lesson is focusing on the importance of palliative care and real compassion and renewed focus on human dignity. Fr. Matt said he thought yesterday about what if it actually passed, but he realized regardless of whether it passed, his job of living out the Year of Faith and his own call to holiness increases even more. That this was such a close margin of victory shows how alive the culture of death is and our work is cut out for us. It’s a moment of consolation. Scot said the only person who worked harder than Janet on this was Cardinal Seán. He asked her on a personal level, having lead this effort for the archdiocese, what’s it like for her now. She said it was hard and there were many days when it seemed bleak, but Cardinal Seán was undaunted. Nothing was going to deter him. The people in the other dioceses were ready to work from day one, especially in the pro-life offices. She said a major newspaper wondered how this was turned around and she said it will stand as an example of a major turnaround of a political campaign. In the end it really did come down to prayer. Scot said we couldn’t have won without the leadership from the Massachusetts medical community and the disability community, plus the various pro-life and pro-family groups. She wins the book “Pray, Hope and Don’t Worry: True Stories of Padre Pio Book II” by Diane Allen. 3rd segment: Scot said about 7pm he’d started seeing that all the polls seemed to have been right all along. The Democrats did very well. What many people thought would be a moderate Republican mandate turned out to be a slight repudiation of that and a moderate Democrat mandate. We have the same general makeup of the House and Senate and of course the White House. Janet said the GOP took a beating it didn’t expect. Romney had emerged as a strong candidate in recent weeks, but in the end it wasn’t enough. She thinks about the McGovern coalition of 40 years ago coming into its own here. Latinos, African-Americans, Asians all came out for Obama. People were really turning out for the Democrat platform. The truism that the incumbent pays for economic trouble didn’t bear out. Scot said self-identified Catholics went as a majority for Obama and the Catholic bloc tends to go for the winner. Fr. Roger said the Church only forms a small percentage of Catholics on Sundays to form them in the traditional way. We have to try to form those Catholics who are least somewhat still associating with the Church. If we’re not able to help Catholics identify the culture of life, we’re not going to be able to evangelize the culture as a whole. In the exit polls, he saw the chasm between those who are married versus those who are not married. Most pundits don’t look at this sliver of population. Sixty percent of married men voted for Romney and 53% did, but large majorities of the unmarried voted for Obama, especially women. He noted that for the first time in America, the majority of adults are not married. He said once people are married and raising children, the whole openness to the culture of life issue becomes more important. The unmarried don’t think about it in the same way. Fr. Matt said it shows we’re ripe for a new evangelization. He noted that at his parish they got an irate call from a parishioner over the No on 2 sign on the church’s lawn. There is a misconception about the relationship between the Church and the state. We need to educate about our rights, what are our civil rights. People don’t understand what rights religious people have. What the right to live and die means. As a Church we need to address this on a broad scale, especially on how the Church is involved. Scot said his hope is that the Church will continue to help people overcome these misunderstandings, especially now that we’re not in an election season. Some people rejected what the Church was saying because they said it was partisan. We need to educate on even the basic foundational principles. Americans largely misunderstand what the Constitution says about the separation of church and state. He said the bishops have done better in the past 16 months than in the rest of his lifetime. Scot said there’s already debate on the future of the Republican Party and its relationship to life issues, immigration issues, and economic issues. He said it’s troubling to him that we will have two parties who may be moving left. Fr. Roger said his big takeaway is that Republicans won’t win another national election until they change immigration policy.